Good performers in the May garden .. for you !! Garden Lovers, did you know there’s another interesting near evergreen shrub to brighten the late garden that’s flowering now.. ? For an intriguing fresh chartreuse splash in the May garden, Holmskioldia sanguinea lutea or Gold Chinese Hat from the lower Himalaya & Myanmar is for you ! I’ve used it here in the ‘Sea-Changer’ garden in the Sun Trap plot that receives northern sun all year but it would also tolerate half day sun as a an upright to lax, 2m shrub with a cut after flowers to bring new canes for the following season. Just nearby and for combined ‘pop’ at the same time of year, you could use Barlaria cristata ‘Lavander Lace’ as a really useful sub-shrub to around 1.5m with a cloud of pretty, striped, mini trumpets. Soooooo pretty, just as the worst of the heat has passed and we look into the garden for some fresh seasonal change. Posted on 22/05/2018 22/05/2018 Categories , Coastal Art, Events, Gardens, Grassy Plants, heliconia, Media, Tropical Plants, Warm Temperate BulbsTags design, flowers, garden design, gardens, landscape, lush, outdoor, plants, shrubs, Texture2 Comments on Good performers in the May garden .. for you !! ‘Planty Fierce ’18’ at the end of last month was a sparkling Autumn day, refreshed by an early shower and internet was high from all visitors, especially this young one having a closer look at the mirror Buddha on the long deck looking down to ‘Sea-Changer’s’ Shade Hut. Nothing extinguishes interest and plenty of people arrived into brilliant sunshine in the Sun Trap plot where I spoke to many on questions around how to make their home gardens even better ! The 2pm ‘Walk & Talk’ brought forward many interesting questions, like how to make a ‘green-fence’ alternative to fence palings using Solandra longiflora over black pvc coated mesh. Thanks to all PF ’18 Helpers and Peter & Ruth Donnelly’s fabulous Coachwood sales tables loaded with new and interesting ‘must haves..’. Garden Lovers, see Facebook Event page for Planty Fierce details this year, bringing you two Central Coast gardens. Visit Ray Henderson’s iconic ‘Paradox’ at Glenning Valley in the morning and my ‘Sea-Changer’ after lunch at nearby Forresters Beach. Its a lovely day out of the city, to see a pair of exciting designer gardens as inspiration for your own, just an hour’s drive north on the Pacific Motorway from the on ramp at Wahroonga. NOTE: many of the plants you see at each garden will be for sale on the day !! ‘Planty Fierce’ Saturday week, 29th April 2017 don’t miss it ! Posted on 17/04/2017 04/04/2018 Categories , Coastal Art, Events, Gardens, Grassy Plants, heliconia, Media, Tropical Plants, Warm Temperate BulbsLeave a comment on ‘Planty Fierce’ Saturday week, 29th April 2017 don’t miss it ! Su’s Neem Oil fixerupper .. ! Welcome to high summer and all its attendant pests and disease that can really spoil your gardening fun. I don’t often make product suggestions but Su Trathen has found Neem oil in her Balgowlah garden, to be an effective drench or foliar spray against sap sucking insects and maybe even those pesky Stink Bugs, that can commandeer your best citrus in a few hot weeks. Also effective against similar scaly attacks on orchids and especially patio pots like lush philodendron & spathiphyllum, susceptible to attack on dry foliage within overhanging eves or shade sails. Clean citrus foliage within 9 days of application ! Its often the price we pay for a short summer holiday away, returning home to horrid plants looking a sticky mess. Try Neem as a quick and easy way to restore them to good health !! Posted on 03/02/2017 03/02/2017 Categories , Coastal Art, Events, Gardens, heliconia, Tropical Plants, Warm Temperate BulbsTags design, gardens, plantsLeave a comment on Su’s Neem Oil fixerupper .. ! Flowering bulbs are often associated with a cool temperate climate, did you know there are many interesting easy to grow bulbs better suited to Australian east coast growing conditions that love higher humidity and our wet summers? 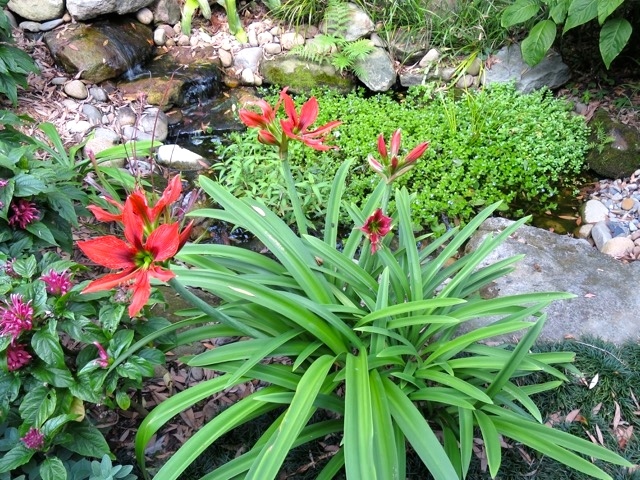 Hippeastrum aulicum actually grows on trees, in rock crevices or among rocks as in this Paradisus garden for John & Susan Trathen’s Balgowlah garden. Maybe there’s a sheltered spot for some of these swish Sth American flowers hippeastrum species, to add late Autumn colour to your garden too ..